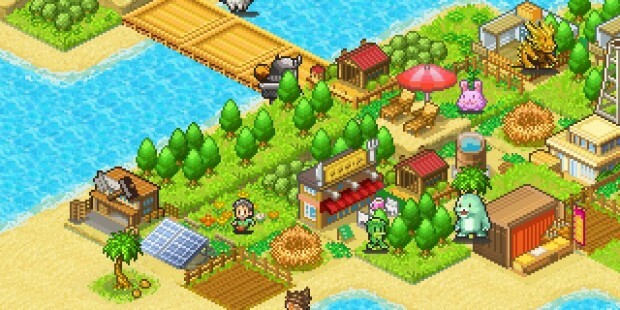 Kairosoft's monster sim is still one worth returning to. Kairosoft is no stranger to addictive simulations, and they've captivated audiences with adorable adventures like Game Dev Story or Mega Mall Story, proving that sometimes, even the most simple of interfaces can make for a fantastic game. Beastie Bay, the ambitious dev's latest title, is a decidedly different beast -- a few of them, actually, and it's an exciting sim bursting with personality. Beastie Bay takes you to a lush tropical island resort on which you're tasked with customizing and decorating your plot of land a la Sim City or other popular games. You'll need to collect various resources, create special structures, and come face to face with cute little monsters in particular area. Resources like food and lumber are required to build new locales and upgrade existing structures, and may be found by going on expeditions meant specifically for amassing goodies. You'll need to do research and development in order to continually improve your resort. That's actually where the game does feel a bit rushed: it can be difficult to find your way despite the tutorial assistant helping you along the way. Often, you might find yourself wondering what to do next or how to do it. You will need to take some time to figure out what needs to be done in some situations, but it's easy enough to do so for players who don't mind taking a little initiative. Once they do, they find themselves in a comfortable cycle. It's a predictable cycle, but one that Kairosoft has done well to ensure never gets boring. The focus is clearly on gameplay over flowery visuals, with pixel art making up a large chunk of the aesthetics of your island resort. It works, though, and like with previous releases from the developer, give the game a whimsical, jovial feel that disarms you -- it's so cute, it shouldn't be difficult, right? It's also sporting some high-octane tunes that stick with you long after you shut off the app, quite befitting of how hectic the in-game rush to build a bustling resort can be. Beastie Bay is an adorable tale split into Pokemon and Sim City halves, where both sides battle to take precedence, but instead find a happy medium. It's not in the leagues of Game Dev Story, but it's still well worth your time and attention, especially if you're a Kairosoft fan or looking for the cutest exercise in time management you may ever see.